Their studies are funded in part by the Center's partnership with the World Surf League PURE, which enables Lamont-Doherty scientists to pursue critical research that advances understanding of climate impacts on the ocean. Bärbel Hönisch, a marine geochemist, studies how seawater chemistry changed through time. Today, the ocean is becoming more acidic due to the rising concentration of carbon dioxide in Earth's atmosphere, about 30 percent of which is absorbed by the ocean. While this process helps to minimize global warming, the dissolution of carbon dioxide in the ocean leads to the formation of carbonic acid. As the name implies, the addition of carbonic acid makes seawater more acidic and this 'ocean acidification' makes it harder for calcifying organisms such as corals, mollusks, and some plankton to build their shells and skeletons. The current pH of the ocean is around 8.1, representing a 25 percent increase in acidity over the past 200 years. As the amount of carbon dioxide in the atmosphere continues to rise, scientists expect seawater acidity to increase another 25 percent by the end of the 21st century. This level of acidification is similar to that of the Paleocene-Eocene Thermal Maximum (PETM), which occurred around 56 million years ago. During the PETM, a sudden rise in atmospheric carbon dioxide coincided with rapid warming and seawater acidification—conditions that lasted for 70,000 years or more. "Our research has shown that the two degrees Celsius warming at the end of the last ice age had a stronger effect on foraminifer species abundance and latitudinal migration than the 0.15 unit acidification of the surface ocean," Hönisch said. "So in some ways, one might say that warming is a greater environmental stressor than acidification, at least for planktic foraminifera with this specific extent of warming and acidification. However, warming and acidification will also go hand in hand in the future and their respective effects will add up." Hönisch also explained that the effects of rising temperatures and acidification of seawater won't be the same throughout the global ocean. "There will be a lot of variability in the conditions in the ocean," she said. "There may be refuges where certain organisms can survive." Although observations of past ocean changes may seem grim, Hönisch noted that many marine organisms are extremely resilient to environmental change. Even the devastating impact of the Chicxulub asteroid 66 million years ago didn't completely wipe out life in the sea, so there's hope for the survival of marine organisms despite our rapidly acidifying oceans. Hönisch's research demonstrates how information about past phenomena can be helpful today, and in the future, if we study and heed their messages, which, in this case, have been left for us in sediments at the bottom of the sea. Geochemical tracers measured in a coral's skeleton are sensitive to water temperature, salinity, river discharge, and other environmental parameters. Since healthy corals grow continuously throughout the year and can live for several centuries, massive corals can be used to create continuous records of past changes in water temperature, salinity, and other conditions that extend back several centuries. Some of Linsley's recent research focuses on coral bleaching events, which are occurring with increasing frequency as the temperature of the ocean rises. Tiny algae live in the tissues of corals—they're what give corals their bright colors—and have a symbiotic relationship with the coral animals. For example, the coral provides the algae a rich supply of carbon dioxide and the algae provide corals their main source of food. Corals are extremely sensitive to temperature changes and when the ocean temperature rises, even one degree Celsius, corals get stressed out. When this happens, the algae are expelled from the corals, resulting in "bleached" white coral structures. During a bleaching event, algae may not disappear uniformly from coral, due in part to the fact that there may be many different species of algae present on one coral formation. In some cases, corals can recover but if the water remains warm, the corals will usually die. "Once a certain, site-specific temperature threshold is maintained for a specific number of weeks, many corals will bleach. However, other stresses can also cause coral death which is sometimes hard to distinguish from bleaching," Linsley said. Over the course of Linsley's career, he has studied coral bleaching events in Panamá, Fiji, and Tonga. 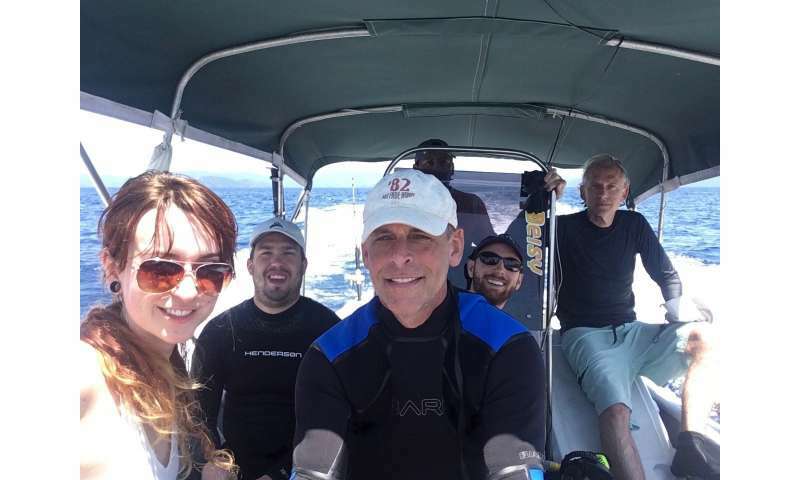 Most recently, in March 2018, he returned to Panamá to examine a bleaching event for the second time—a trip that was supported by the Center for Climate and Life. 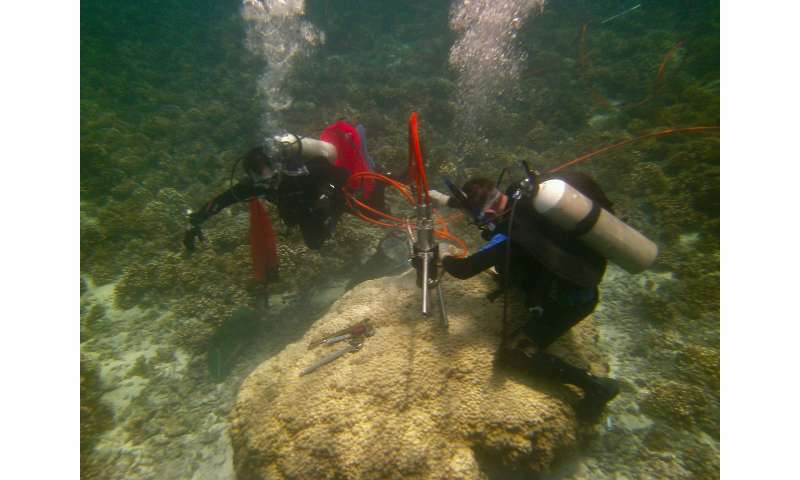 In Panamá, Linsley and his team collected five coral cores from an area in the Gulf of Chiriquí, on the Pacific coast. The water temperature in the region is generally 32 degrees Centigrade, or 89.6 degrees Fahrenheit, with only two degrees of seasonal variation. There's very little human development in the area, so many mangrove forests remain along the undeveloped coastline. The winds in the region move east to west and a wind shadow that blocks the tradewinds; there is both direct rainfall into the ocean and runoff from the land. 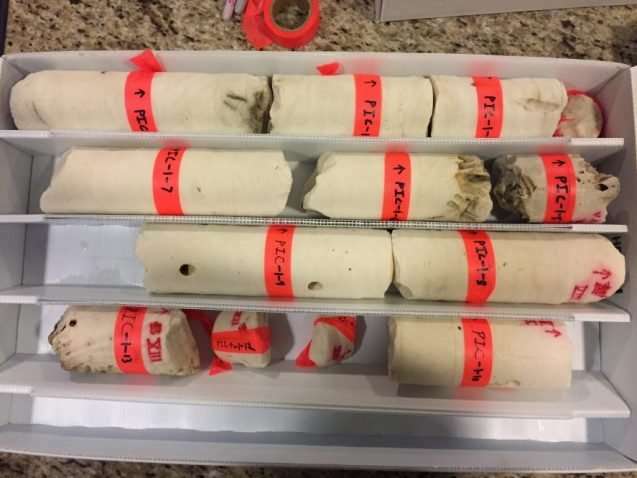 The corals record all of this environmental activity and, through different analyses, Linsley is using the cores he collected in Panamá to reconstruct the history of coral bleaching and hydrologic changes in the region back to the mid-1800s. Linsley's results will ultimately improve understanding of seasonal and decadal-scale changes in rainfall in Central America.